"It's only a bit of cheese!" 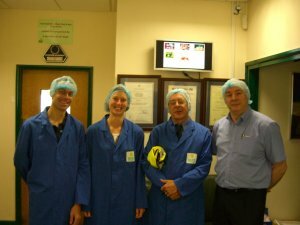 We were invited to visit Dairy Crest's Hartington Cheese Factory at the end of July and spent a good three hours being shown round the state of the art facilities by Alan and Andy. It put our goat's cheese making efforts into perspective, but the process is very similar, just all done by machine. Unfortunately, we were unable to take photographs as the machinery was the only one of its kind. However, we were able to take photographs of the storage rooms, and we have also done plenty of tasting to ensure the quality of the end product was good! 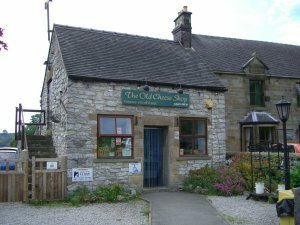 Hartington is the oldest UK cheese factory, yet it has very modern equipment installed so that every movement traditionally done by hand is now computer controlled. It was established there by the Duke of Devonshire in the 1870's and Thomas Nuttall of Beeby in Leicestershire took over in 1900. He had been keen to get away from an outbreak of foot and mouth disease on his home patch in the Vale of Belvoir, the traditional home of Stilton. On his first day Nuttall processed 250 litres of milk. Today, with a workforce of 160, an incredible 110,000 litres of milk are turned into Stilton every day on average and this produces 1000 x 16kg of cheese! Stilton takes 3-4 months to mature, so in September and October, production is raised to its maximum ready for the Christmas market. The most important thing is to keep the temperature and humidity precisely right for the bacteria to remain active, but not too active. In the optimum conditions, bacteria will be multiplying every 20 minutes. After 24 hours of being mixed, cut and turned, much of the whey has been drained off. This is dried and used in a variety of foods as whey powder. 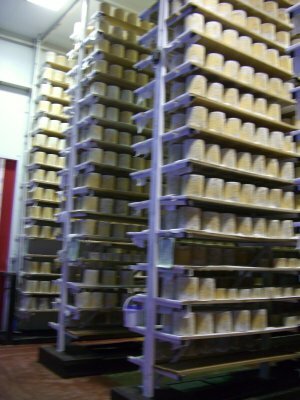 The cheese blocks now enter a second, cooler room. Up until now, they have been stacked in blocks: 12 large cheeses in each block, 4 high = 48 cheeses. These blocks spend the next 4 days, in double stacks (8 high) being turned twice a day in order for the moisture (whey) to drain out. That's 96 cheeses in each stack! There are enough air spaces left so that the blue mould can grow evenly within the cheese. We saw White Stilton being made, so this would not have any mould growing on it. On entering the huge storage rooms, the smell of ammonia hits you! This is a by product of the developing mould. The cheeses are stored for 3-4 months stacked on paper covered wooden planks. They are turned by hand regularly - to begin with, every day, but after a while, once a week. This is to ensure an even moisture distribution. The cheeses are then graded for quality and vary from creamy to crumbly. The cheeses are eventually packed and sold, although usually not as whole cheeses. 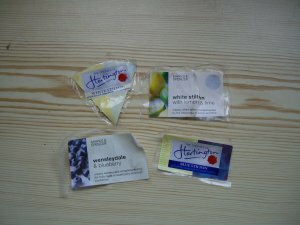 They are cut to different shapes and sizes depending on what the supermarkets need. Some have fruit added - the cheese is cut into chunks, the fruit (eg cranberry) added and then re-pressed together. 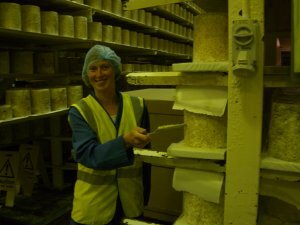 Dairy Crest's other factory, in Davidstow, produces Cheddar such as Cathedral City - that's for another day! The whole morning spent touring the factory was an eye opener and there is not enough space here to write all we learnt. But as Alan said at the end of our visit "It's only a bit of cheese!" We are confident that with our own small scale experience, and now having seen cheese making on a larger scale, we can share these experiences with children on our MCFE visits. Dairy Crest has announced the proposed disposal of its Stilton and speciality cheese business based at Hartington, Derbyshire, to Long Clawson Dairy Limited for cash proceeds of approximately £3.5 million. The transaction is conditional on the completion of employee consultation and is expected to complete by the end of August 2008. 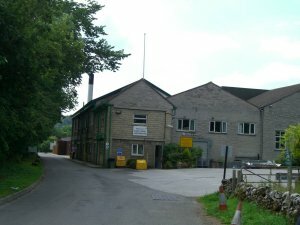 "This disposal is in line with our strategy to focus future cheese activities on developing our branded and premium retailer branded products.� This includes Cathedral City, the UK's biggest cheddar brand worth over £170 million at retail value.�After careful consideration we felt that the best option available for our Stilton business was a sale to Long Clawson."